The Quality Inn Niagara Falls is located in Niagara Falls, New York and offers quality accommodations, friendly service in clean, comfortable surroundings with free wireless high-speed internet access in all our rooms. The Quality Inn Niagara Falls Hotel is only a short distance from the Fashion Outlets of Niagara & The Summit malls, movie theater, Seneca Niagara Casino, Hard Rock Cafe Niagara Falls USA, Niagara University, and The Mighty Niagara Falls itself. This Niagara Falls hotel has 100 guest rooms featuring Free Wireless High Speed Internet Access, local and toll-free phone calls, satellite color televisions, coffee makers, hairdryers & irons with ironing boards. 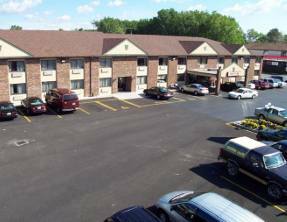 This Quality Inn is located approximately two miles from Niagara International Airport and three miles from the American and Bridal Veil Falls. It’s a half-mile from Niagara Factory Outlet Mall and five miles from Casino Niagara. The inn has an indoor pool, a gift shop, tour desk, and Antonio’s Restaurant on site. This Quality Inn also offers shopping coupons, free coffee, and free parking. All rooms have air-conditioning, hairdryers, irons, coffeemakers, free wirless high speed internet, and cable TV. Guests can enjoy great accommodations of uncommon quality. The hotel’s unique, casually upscale furnishings in the spacious guest rooms and suites will instantly put you at ease, while in-room amenities and services will provide you with the latest technology to make your stay as enjoyable and convenient as possible. The Strangio Family is proud to host your next wedding, conference or banquet at Antonio’s Fine Dining Restaurant, located adjacent to the Quality Inn Niagara Falls Hotel in Niagara Falls, USA. With comfortable seating for 20-600 guests, your next Niagara Falls meeting can be located only minutes from the mighty American Falls at Antonio’s!